The poll panel dubbed reports of large scale failure of EVMs as "exaggerated projection of reality"
Voters wait in queue to cast their ballots for Kairana bypollsNEW DELHI: Opposition parties and the ruling BJP on Monday moved the Election Commission claiming "hundreds" of EVMs and paper trail machines deployed for Kairana Lok Sabha and Noorpur assembly bypolls developed snags and were not replaced for hours. But the Election Commission termed as "exaggerated projection of reality" reports of 'large scale' failure of EVMs during Lok Sabha and assembly bypolls in Uttar Pradesh and Maharashtra and said adequate number of reserve machines are provided for any eventuality. Sources in the poll panel did say that shoddy handling of VVPAT machines by the ground staff, especially when the temperature is high, led to their heating, resulting in their malfunctioning. SP leader Ramgopal Yadav and RLD chief Ajit Singh along with others met top EC officials claiming that the faulty EVMs were not replaced on time. The leaders demanded that repoll should be announced in polling stations where EVMs were not replaced for over one-and-a-half hours. At polling stations where EVMs were replaced within one-and-a-half hours, additional time should be granted to voters to exercise their franchise, they told reporters after meeting the EC. They alleged that poll officials "took their own time" in replacing EVMs in rural areas, the base of their voters. The EVMs were, however, replaced with alacrity in urban areas. 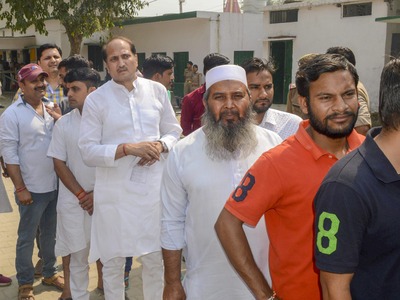 A BJP delegation, including general secretaries Bhupender Yadav and Arun Singh besides its media head Anil Baluni, informed the Election Commission that EVM machines were dysfunctional for a long period in 197 booths in Kairana and Noorpur. Yadav told reporters that they urged the EC to hold repolling in booths were election process was severely affected. They asked the EC to send observers t o identify such booths and also find out reasons for EVM malfunction. Concerns were also raised about the functioning of paper trail (VVPAT) machines. Sources in the EC noted that failure on part of the ground staff led to heating of the machines. An official said those who skipped training programmes and "spent time on their phones during training sessions" placed the machines at places where 'heat sensitive' nature of the device created problems. A poll panel spokesperson later said a joint delegation of the RLD, SP and Congress and a separate delegation of BJP representatives met the EC and brought to its notice concerns about functioning of VVPAT machines in some of the polling booths in bypolls today. "The Commission assured them that all necessary action will be taken on issues raised. They were also assured that the concerns related to VVPAT have been verified on ground and appropriate actions have been taken by the District Electi on teams. The Commission has also informed that on the basis of reports of RO, DEO and Observers, further action will be taken." The EC said voters who have queued up outside polling stations will be allowed to cast votes despite end of polling hours. But in a statement, poll panel denied that the failure of the voting machines was unusual. "... the Commission allocates sufficient reserve of EVMs and VVPATs for every general and by election to the Lok Sabha or state assembly. "It is pertinent to mention that during commissioning of EVMs and VVPATs, apart from EVMs and VVPATs required for deployment at every polling station, adequate number of reserve EVMs and VVPATs (around 20-25 per cent) are prepared to replace any defective machine on poll day at the polling station," it said. It said the reserve EVMs/VVPATs are kept with sector officers, who replace the defective EVMs/VVPATs. Since each sector officer is entrusted with only 10-12 poll ing stations, the time taken to replace any EVM/VVPAT is normally less than 30 minutes. "The Commission undertakes a comp rehensive examination and root-cause analysis of all defects observed in the machines through the Technical Experts Committee of the Commission and necessary remedial actions are being taken for smooth conduct of poll process," the statement added.